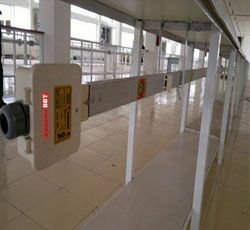 Busbar systems are pre-fabric applications that carry the electrical power to the system by means of the windows designed for branching out the power at standard or nonstandard intervals. In the busbar system, the electric current is conducted by the busbars without requiring electrical cables. The external casings of the busbar systems are made of aluminum materials in order to prevent rusting with the corrosive effects and ground faults even years later. They may be used in many different areas such as shopping centers, factories, hotels, schools, office buildings, transformer centers, LV outputs, as well as the distribution and transmission of lighting systems. All the insulating materials are made of halogen-free, non-flammable and fire-retardant (V0) materials.